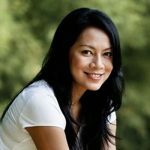 Dewi Lestari, under the pen name Dee Lestari, was born in Bandung on January 20, 1976. Fourth child of Yohan Simangunsong and Tiurlan Siagian, Dee has one brother and three sisters. All of her sisters also work in the creative industry. Her oldest sister, Key Mangunsong, is a director and a screenplay writer. Her older sister, Imelda Rosalin, is a jazz pianist and singer. Dee’s younger sister, Arina Ephipania, is a vocalist from a renowned band Mocca. Dee attended elementary school at SDN Banjarsari III Bandung, junior high at SMPN 2 Bandung, and high school at SMAN 2 Bandung. She was graduated in 1998 as a Bachelor of Political Science from Parahyangan University, Bandung. In 2003, Dee was married to singer Marcell Siahaan. In 2004, they had a son, Keenan Avalokita Kirana. The couple was divorced after five years of marriage. Since 2008, Dee got married to Reza Gunawan, a holistic health practitioner based in Jakarta, and in 2009, they gave a homebirth to a daughter named Atisha Prajna Tiara. Now, Dee lives in Southern Tangerang, suburb area of Jakarta, with Reza and her two children. rom childhood, writing was always Dee’s deepest passion. Onfifth grade, little Dee imagined one day she would go to a bookstore and saw her published book displayed on the shelves. Not long after, she bought a notebook, and wrote in it up until the last page. At that time, for her it was the closest experience of being an author.